How Much Does "Trump Country" Rely on Exports? Last week the Department of Commerce released recommendations for tariffs on steel and aluminum under section 232 of the Trade Expansion Act of 1962. As the report notes, the President is required to make a decision on these tariffs by April. This recommendation comes after a period of an export slowdown. Exports for many manufacturing industries are down including machinery, transportation equipment, and textiles. And many of these industries are users (rather than producers) of steel or aluminum. To add an additional flavor to what is going on here I started digging around with the Export Monitor data that the Brookings Institution puts together and 2016 election results for the 100 largest metro areas. A couple of rough charts are below. In 2016, 87 percent of Americans living in a metropolitan or metropolitan statistical area (as determined by the Office of Management and Budget). These are areas with a “substantial population nucleus, together with adjacent communities having a high degree of economic and social integration….” About 68 percent of the population lived in one of the 100 most populated metro areas. A few of interesting things standout. (1) Trump did better in areas where exports have been growing more recently and worse in areas where exports have been slowing down. Where have exports been growing? Coal and petroleum is growing. Oil and gas too. So is agriculture. This all seems very much to be Trump’s base. But this also seems somewhat inconsistent with the narrative that Trump won because of areas where exports (and jobs) are in decline. (2) Clinton did worse than Obama in areas where exports have been growing more recently. However, she did about the same as Obama independent of growth or decline over the entire Obama administration. 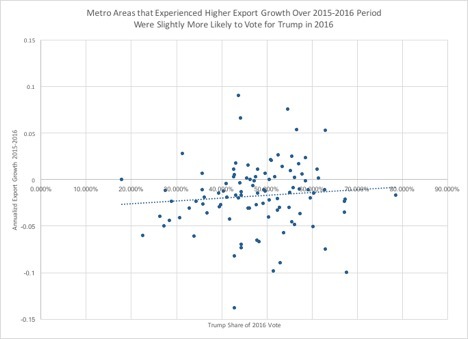 (3) Trump did better in areas where exports were more likely to be a higher percentage of the local economy. (4) Trump (2016) did better than Romney (2012) in areas where exports are on the rise and where exports are a more important part of the economy. In areas where Trump won, exports accounted for 10.3 percent of the economy compared to 9.6 percent in areas where he lost. In areas that Romney won in 2012, exports accounted for 9.2 percent of the economy in 2016. Overall this tells me that exporting country is "Trump country." But that's only for areas where exports are on the rise: oil & gas, services, and agriculture. Not manufacturing. At least not for places where two-thirds of the country live.